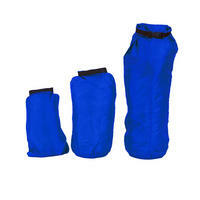 This set of 3 provides crucial protection from the elements for camping essentials. Weather resistant and ultra lightweight with roll top compression, the dry sacks are ideal for use in a rucksack, and are all different sizes (2L, 4L and 8L) to suit everyone's requirements. They are ideal safely transporting food, clothes, a phone etc.